Bug please help the site that I'm riding! I use the platform for you at a time, migrated to the Webnode Yola, Yola because I found better, you can change settings and more. 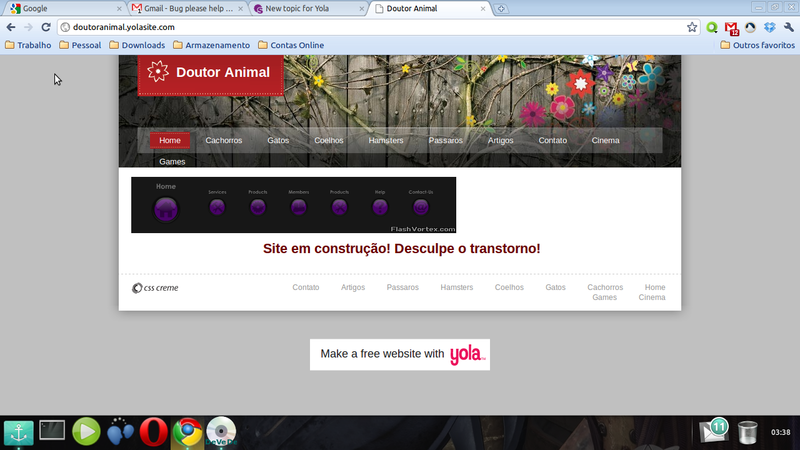 However I have had a problem with the portal that I'm riding to test live, whenever I enter the address of my site to see how this going and what is happening withdoutoranimal.yolasite.com is the following, not the page that appears created, isshowing the layout entigo, which already excludes everything but still keeps appearing, I published several times with the new laout the new pages and new content, but still when you enter the site that appears is the old layout , sometimeseven appears in the new layout and new pages, but to start surfing, then back to the old. Already trying to access from other browsers, I tried to delete the browser cache,but still gives the same error. I ask your help please, because I do not want to lose my web address. I'm investigating with one of our engineers and will come back to you as soon as I have a reply. Please could you check your site again - it should be in order (remember to click on the Refresh button). Please let us know if you're still experiencing any issues. ok, I'll check and post already been resolved .. Thank you for attention, now more like the service! Pereitamente returned to work, tried several times and gave no more trouble. Thank you for your attention and speed, and I apologize for my English, this means that rusty. Glad to hear it's all good!